Posted by Pressure Washers Area on June 17, 2014 . Pressure washing is really a good and time-effective way to spring clean the house exterior, prepare it for new paint or even make your house more attractive to buyers. In the previous article Spring Cleaning Tips for Using Pressure Washer we covered some ideas how to utilize more effectively your pressure washer for your house cleaning tasks. 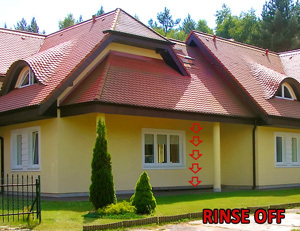 Now, we are going to publish detailed HOW TO PRESSURE WASH series of articles to cover the different uses. In this HOW-to we will describe how to pressure clean your house. How powerful pressure washer should I get? It all depends on the surface material. You can go for 2500-3000 PSI models in case you have vinyl siding or siding that does not have painted surface. For more vulnerable materials, such as aluminum, it will be best if you choose 1200-1600 PSI pressure washer. PSI or 'pounds per square inch' is the power of the water spray. The higher PSI, the faster you will pressure clean. Choose a unit that has detergent dispenser (foam dispenser) as you will use cleaning solution. Step 2: Prepare the working area: cover the fragile house exterior – light fixtures, lamps, flowers and plants with plastic coverings and secure them with duct tape. Remove any obstacles from the working area. Step 3: Prepare the surface: scrub manually any visible mildew from the surface. Step 4: Prepare the cleaning solution. Fill the pressure washer's detergent bottle/tank with combination of concentrated detergent and water. The detergent-to-water ratio varies from brand to brand so make sure you read the label and follow the instructions there. Step 5: Hook the garden hose to the water supply and the pressure washer. When you are ready, turn on the water. Step 6: Test the pressure output on an invisible area of the surface you are about to clean. Start at about 3-4 feet from the surface and move closer as needed. Make sure you are close enough to remove dirt effectively and far enough not to harm the surface. The nozzle should be at least 15 inches away from the surface. Step 7: Apply the detergent starting from the bottom and work all the way up. Allow to for 5-6 minutes. Step 8: Rinse off with clear water, work from the top to bottom.